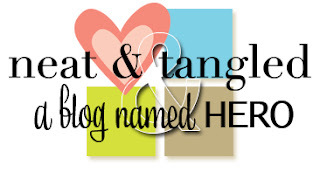 This week we are having lots of fun at A Blog Named Hero...we teamed up with the lovely Neat & Tangled and my DT friends are totally rocking it! I played with the super versatile set On The Strip 2 and I really love all the possibilities of this set. 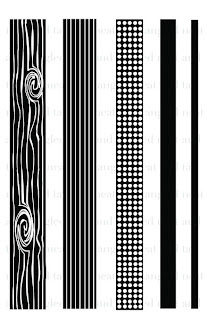 The solid stripes are great and they stamp like butter, but I wanted them to look a little grungy for the masculine card so I pressed the block with the stamp very lightly to get the distressed look. Thanks for the visit and be sure to check out the A Blog Named Hero and the Neat & Tangled blog. Na A Blog Named Hero imamo ponovno `sodelovalni teden`- ustvarjalne moči smo združili s podjetjem Neat & Tangled. Moja šibka točka so vse sorte štampiljk brez motivov in tale črtasti motiv mi je bil takoj všeč pa sem na zalogo naredila eno moško voščilnico. 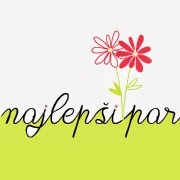 Od našega `maskirnega´ Ko me inspirira... izziva si še vedno nisem opomogla od vse inspiracije in še vedno hitim lepiti Post It lističe... Hvala za obisk in lepo se imejte. WOW...WOW...Tina, this is one absolutely super-FABULOUS card! I love how you achieved the grungy/distressed stamping, love the colors with the kraft, AND last, but not least, I love the FABULOUS design! Well done, my friend! Čudovita je. Všeč mi je kako se napis ponavlja. O, krasno moško voščilnico si naredila in všeč mi je zabrisan izgled črt, čeprav verjamem, da štampiljke super odtisnejo. Love the stripes. Good to hear the solid stamps stamp well. TFS.